This is my second attempt at cow nails - the first ones were done on my sisters nails back in May. As you can see, these ones are a bit different, and the cows faces have more detail. I got the idea for this one from this photo, but tweaked it a bit. For a start, I painted the cow on the ring finger as well as the thumb. Originally I did the noses the same, but then realised that cows noses are NOT slits (see here!). So, with a bit of nail polish remover on a cotton bud I removed the old noses and made them more realistic. I used my white Jordana nail polish as the background colour, the noses were done with pink MIKI polish and I painted on the details with a black Jordana striper. 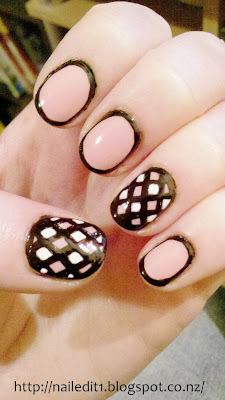 A dotting tool would have been better but I felt a bit lazy. These border nails were my first attempt, and I think they turned out pretty well. Turns out I have no good photos of them though, which is why I'm shoving them in this entry... the photos don't deserve their own post :P. I used a pink MIKI nail polish, white Jordana striper brush and black Jordana striper brush.